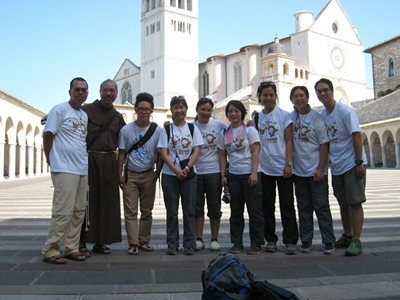 Franciscan March is definitely a very special kind of pilgrimage as we have to complete a 120km walk in Sicily countryside within 6 days. 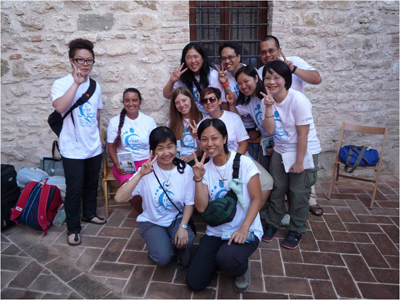 It was a tough journey but at the same time, we experienced the deepest care from our lord through the hospitality of our beloved Italian participants. 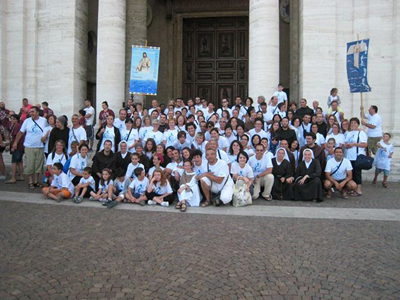 The day we finally arrived at the Porziuncula – Our Lady of Angels is unforgettable as it was the first time I had the feeling that I was so close to Jesus and St. Francis. 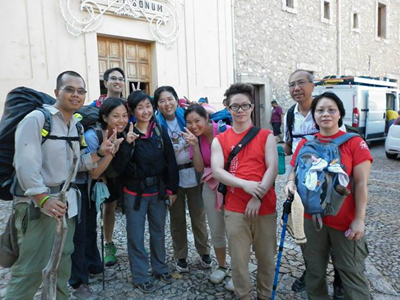 I would like to take this opportunity to express my greatest gratitude towards the teammates from Hong Kong, all the participants from Sicily and all the fathers and flyers, because without them, the trip would not be so successful and fruitful. Garzie! 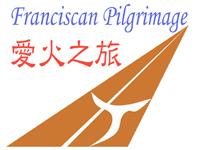 Having an opportunity of participating in the 33rd Franciscan March this year, it is an unforgettable experience for me. The gorgeous Sicilians make me smile from the depth of my heart all the time. We do not afraid of the language diversity, but instead, we always work out a way to communicate between Italian, Chinese and English. And on top of it, I believe singing together makes us united. With the 6 days of hiking over 120 km in Sicilia, indeed, I had no idea where I was in the middle of the bush. However, I enjoyed every moment. I enjoyed being together, singing together, sharing together and praying together. I also enjoyed the first hour of silence walking with the dawn, getting very close to the creature of God in this hour, and along with me was a little Taize song each day over and over in my heart. I really felt God was being with me and walking with me. 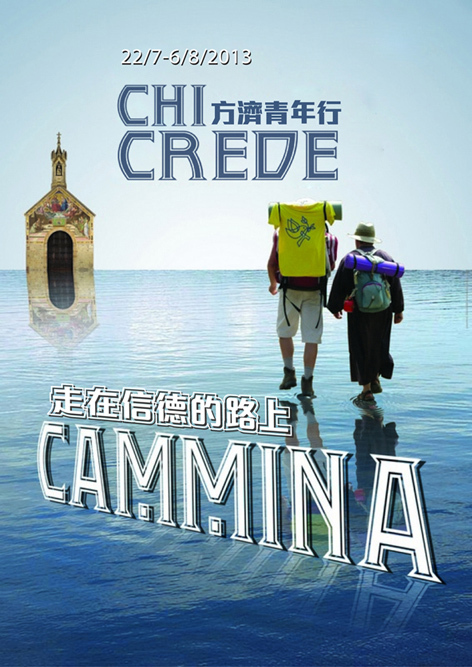 The theme of this year is “Walk in Faith”, I strongly experienced it after the second day of hiking. I nearly collapsed (with joyful heart) when I arrived the destination. Feet were swollen and full of blisters, I doubt if I could continue and finish the rest of the journey. I prayed for strength from God. I told myself that God would not let me bear the burden that I cannot bear. And he listened! Thanks be to God! 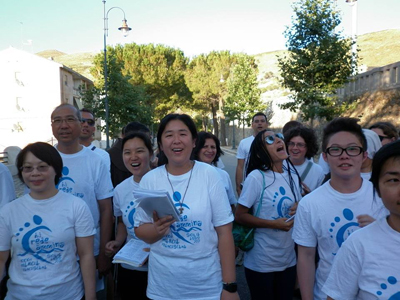 Arriving S. Maria degli Angeli, Assisi, holding hands together and marching into Porziuncola, was another touching moment. 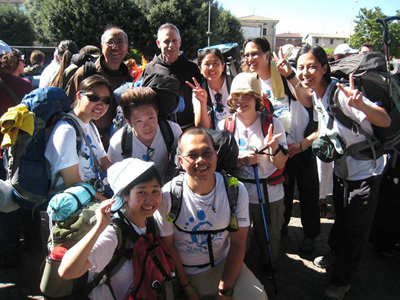 Being touched was not only that we have done the journey with physical tiredness, but also with spiritual grown in faith, the joy of the spirit, God was so close to me, and seemed waiting us for long in Porziuncola. Here, I would like to thank Fr. 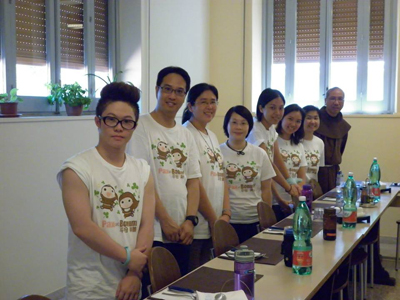 Antonino for organizing the programme with the warmest welcome to the group of Hong Kong, thanks Fr. Gimmi for leading us to sing the “Italian” songs without seeing the score and lyrics, thanks those who cooked for us, accommodated us and helped us in any way. Joy and Peace be with you all!